*Sleeping in is something I don’t get a chance to do that often. Sometimes it is my schedule. Sometimes it is my body not letting me stay in bed. Today, I slept in until 8 a.m. Wow!! It felt pretty good. *After I got up I drove down and got some coffee, and brought it back to Laurie’s house. After having my coffee, and packing up, and doing my morning writing, I loaded up my things and Laurie drove me to the Boise Airport. When I checked in, I was told by the nice person at the Southwest counter that my plane was delayed because of weather in another part of the country. I was suppose to depart Boise at 12:30 p.m. I ended up departing Boise at 2:30 p.m. But it was fine. I hung out in the airport, and read some things online, and kept myself pretty busy. 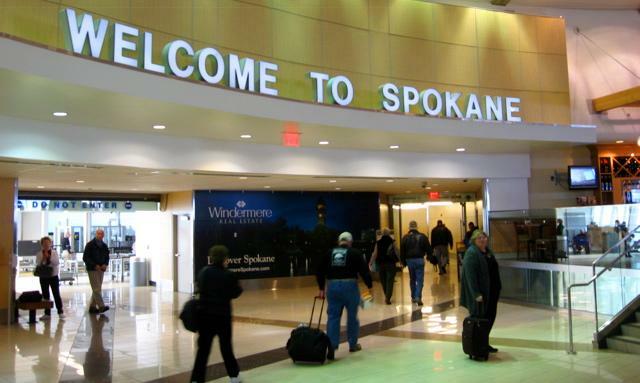 The flight was fine, despite a little turbulence right before we arrived in Spokane. *We landed, I got my suitcase, then had a bit of a panicky moment when I couldn’t find my parking ticket from the parking garage. So I sat down and went through my wallet and finally found it. Whew! I went and found my car, and as I left the parking garage, I decided to take advantage of the complimentary car wash before leaving. After the car wash, I paid for my parking and headed to Kellogg. *The gas in Coeur d’Alene is always about 20 cents cheaper than in Kellogg, so I stopped and filled up my gas tank. Then I headed for home. I arrived home, and Paul was out front doing some weeding as he waited for me to arrive. It was so nice to be home. *Christy hosted our family dinner in her shed tonight. She made a special slow cooker meatloaf, cooked cabbage and salad. We also had some celebratory white wine to toast our all our successes as we are eating better and living a more healthy lifestyle. *When we arrived home, Paul decided to rearrange our bedroom and give it a good cleaning. While he was doing that, I got caught up on Midsomer Murders. After a week of traveling and not sleeping in my own bed, it was nice to crawl into my own bed and go to sleep.